YuMega Dog is a coat and skin supplement, containing Omega 3 & 6 oils. It can help to improve overall skin & coat condition, nourishing & soothing dry skin, as well as potentially boosting coat growth. Results can usually be seen within 3-6 weeks of feeding YuMega Dog. YuMega Dog can be beneficial to give to moulting dogs, to help reduce excess moulting. YuMega Dog contains high levels of essential Omega 3 oils, from Golden Flax seed. These support & strengthen your dog’s hair follicles, helping them to keep hold of their hair for longer, thus reducing moulting. It can also improve the dogs general coat condition and replenish moisture levels in the skin. YuMega Dog also contains specially selected Omega 6 oils, from Borage (Starflowers). These aid the skin’s natural renewal process; nourish & improve skin condition, as well as helping to improve the skin’s barrier abilities & coat growth. 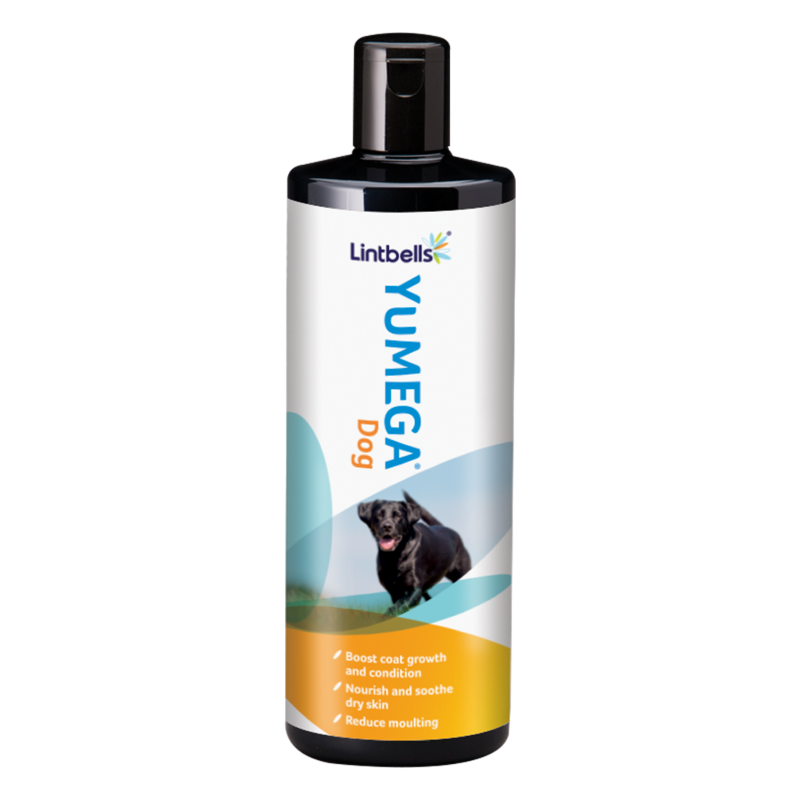 In addition, YuMega Dog contains Linoleic acid, the essential Omega oil. It helps to maintain the skin’s natural moisture barrier, thus helping to reduce/prevent dry skin and dandruff. The natural antioxidant Vitamin E mops up free radicals and supports the skin’s natural defences. YuMega Dog is unique, as no chemical extraction or refinement processes are used when extracting the oils; instead, the seeds are cold pressed and the extracted oil is immediately bottled to ensure its freshness. This maintains the oils in their natural condition, helping to make them highly effective & naturally tasty. Vitamin E, from natural plant sources, is then added to maintain the quality of the stored oil and to help mop up free radicals. Use twice the recommended dose for the first week before increasing to the usual advised dose.